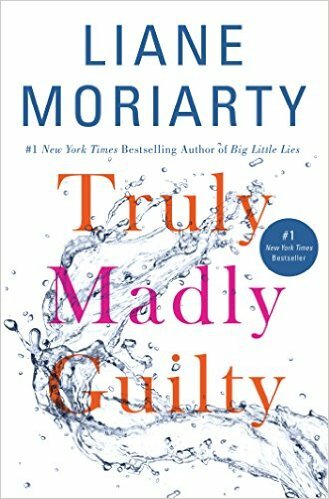 Liane Moriarty is probably my favorite author, and I've done a book review on every single book of hers. I've read one of her books, and listened to the rest of them, and they are some of my favorite books ever. They all take place in Australia, and they all have a really cool twist. They are definitely not boring books, and always are keeping your attention. My two favorite books by her are "What Alice Forgot" and "The Last Anniversary". They were really interesting storylines, and GREAT twists. I've been BUSTING for her to release another book because I flew through all her books a while ago. When I found out that Moriarty was releasing "Truly, Madly, Guilty", I put it on my Audible wish list and purchased it the moment it was released. I will say that this book didn't disappoint, but it definitely wasn't my favorite. It centers around a three families who are all together at a BBQ and something truly tragic happens. At the beginning, you do not know what the tragic event is, and you don't find out until more than halfway through the book. It did go a little slow, and it was a little annoying because I just wanted to know what the big twist was. I also felt that the entire book, leading up to the reveal, was a tad bit dramatic. The book also jumped back and forth from past to present; so before the BBQ, and then after the BBQ. That's something I'm used to in suspenseful novels, but this time around, it kind of bothered me. I tried to figure out what the big twist was, but I was stumped every time I tried to think of something that would warrant the dramatic reactions of all the characters. When I found out what the twist was, I was a little annoyed because even though it was a tragic twist, it still didn't feel like it warranted such dramatic, and over the top reactions from everyone in the book. There were a few interesting subplots in the novel, like surrogacy, job searches, and even a subcharacter having a hoarding problem, which was probably the most interesting to me. Do I think this was worth the read? Yes, definitely. Do I think it was in the top 5 of Lianne Moriarty's novels? Nope.